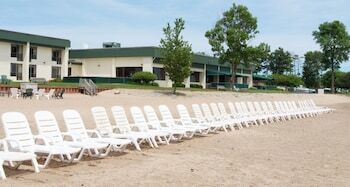 When you stay at Tawas Bay Beach Resort in East Tawas, you'll be on the beach, within a 5-minute drive of Iosco County Historical Museum and Huron-Manistee National Forest. Featured amenities include a 24-hour business center, a 24-hour front desk, and luggage storage. Free self parking is available onsite. A stay at Crows Nest Inn Tawas places you in the heart of Tawas City, within a 5-minute drive of Gateway Park and Iosco County Historical Museum. Free self parking is available onsite. Located in Oscoda, Scenic Resort is on a lake, within a 15-minute drive of Huron-Manistee National Forest and Iosco County Historical Museum. Free self parking is available onsite.